In which geographical area does your group provide services in? An organisation whose primary objectives and activities are Environmental (i.e. ecological) protection and/or environmental sustainability. An organisation whose main activity centres on working to improve the life chances and opportunities of those who are marginalised in society, living in poverty or in unemployment using community development approaches to build sustainable communities, where the values of equality and inclusion are promoted and human rights are respected. All other organisations including Sports, Local Development, Social, Culture, Special Interest etc. What electoral college does your group wish to register for? Please select... Community Environment Social Inclusion Please read the description for each of the 3 colleges. The persons identified will be deemed as the main and alternate contacts for your group and they will be the contacts to which we provide information for your group. It is the responsibility of the contacts to disseminate the information to the other members of your group and so this should be considered in the choice of your contact personnel. These contacts are also considered the nominated voters for your organisation, one of which will have voting rights for your organisation/group at each eligible election. Please note when choosing your representatives that each person can only vote once, even if they are the nominated representative for two groups. Because of the separation of the functions of Public Representatives and the PPN, Councillors, TDs, Senators & MEPs should not be a point of contact or nominated representatives for organisations. Please ensure you have consent from nominated representatives before providing details. I, on behalf of my organisation, agree and consent to personal data and special categories of personal data which I have provided for main and alternate contacts, and for my group/organisation being used by Wexford PPN or its agents* for the purposes of the Network. This may require my personal data being supplied to and discussed with other members of the Network. Wexford PPN, its agents, and network members will be required to comply with the General Data Protection Regulation – Regulation (EU) 2016/679 of the European Parliament and of the Council. I understand that I may request Wexford PPN to grant me access to my personal data which Wexford PPN holds. *Wexford PPN currently uses Form Assembly (online form builder) to collect data, Wexford County Council to store data, and Salesforce as a CRM/Database management solution. 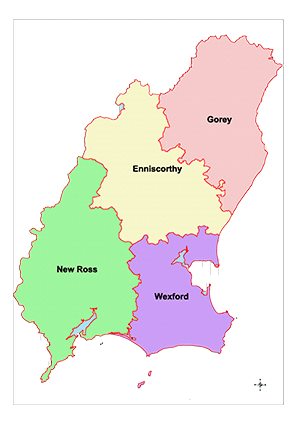 Only groups registered with Wexford PPN prior to 5pm on Wednesday 31/10/2018 will have voting rights for 2018/19 elections.